Cyclotimia shows once again the talent and vision of an electronic shaman who becomes a working conduit between the astral and the cultured. This CD holds two separate works on it, titled “The Invisible Hand of Market” and “Oil & Gas Colony”, and through them, In sixteen different tracks, the world turns into an enlightened eye, watching urban rhythms float together with cavernous rituals and seemingly random phone calls. This is not chaos, but instead it’s a detailed and almost spiritual understanding of invisible hands and invisible minds. The sounds of fax machines become a binary system of rhythm, and finally mix with primitive psychedelics that make a mundane human description of computer language into a profound realization on the track “Digits”. “Nord Stream” is an ancient tribal throat singing, being warped into 23rd century space travel and “Oligarchy” is a surrealist soundtrack of oriental minimalism that you really can’t foresee. Each track shows a different world of ideas that should be explored thoroughly and repetitively. 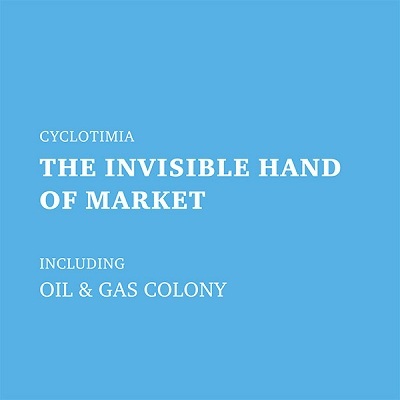 Both magical space empires of “The Invisible Hand of Market” and “Oil & Gas Colony” are wonderful works, in the tradition of Cyclotimia’s music and of Zhelezobeton’s releases.